If you're wondering why I'm sharing a Valentine's Day craft already, well, it's never too early to make something special, and share new ideas! 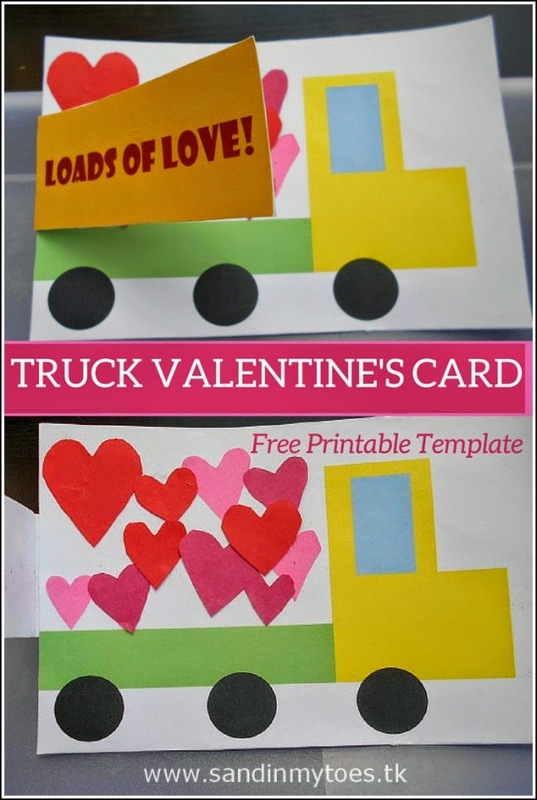 This is the first Valentine's card Little Dude was involved in making, so it had to be something to do with trucks. 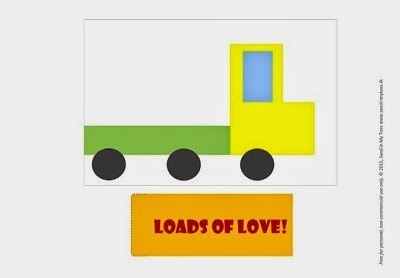 It's not an original idea - put a truck and hearts together and you have 'Loads of love'! You can find lots of these on commercial cards and Pinterest. But this is our version, and best suited for toddlers and preschoolers. And as my little V-Day gift to you, I'm also sharing a free printable template that you can use to make this card easily with your kids. 1. Cut the print out along the grey border and cut the flap separately. 2. 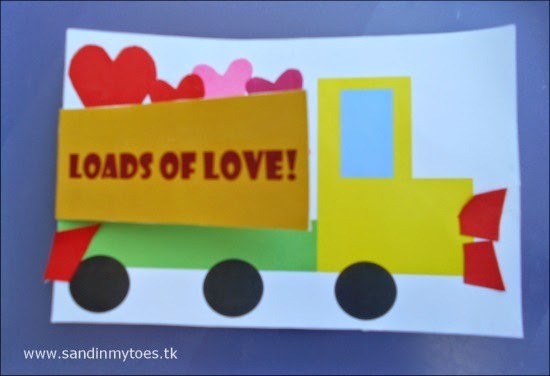 Stick on to card paper of any colour (we used white) and cut out the truck card and the flap (including the dotted line). 3. 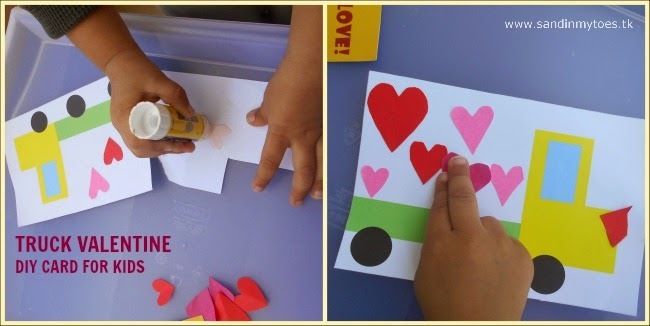 Cut out hearts of different sizes from the pink and red coloured paper. We used red and two shades of pink. It's easier to cut the hearts by folding the paper and cutting out a symmetrical shape. Older kids can do it themselves too. 4. Then stick the hearts on to the back of the truck. 5. Fold the flap along the dotted edge and stick it behind. You can put a message behind the flap, or anywhere the kids want to! I would also like to share Little Dude's enhancements to the truck, which were the headlights an tail lights. Silly me for having left them out! I love his version, it's a bit more personal, isn't it? 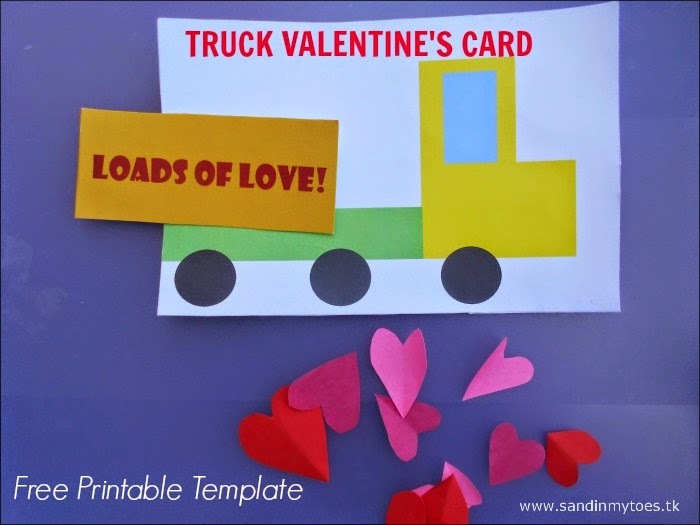 Download the free Valentine Truck Printable here. Once you have clicked on the link, it will open in Google Drive. There is no log-in required. You can either download the printable by clicking on the arrow (for printing later), or print directly by clicking on the print icon. The file is in PDF format, you will have to use Adobe Reader if you are downloading it to open and print later. When you print, make sure your printer's setting is in the Landscape format. I love this idea! Am pinning! What a gorgeous card - great idea! 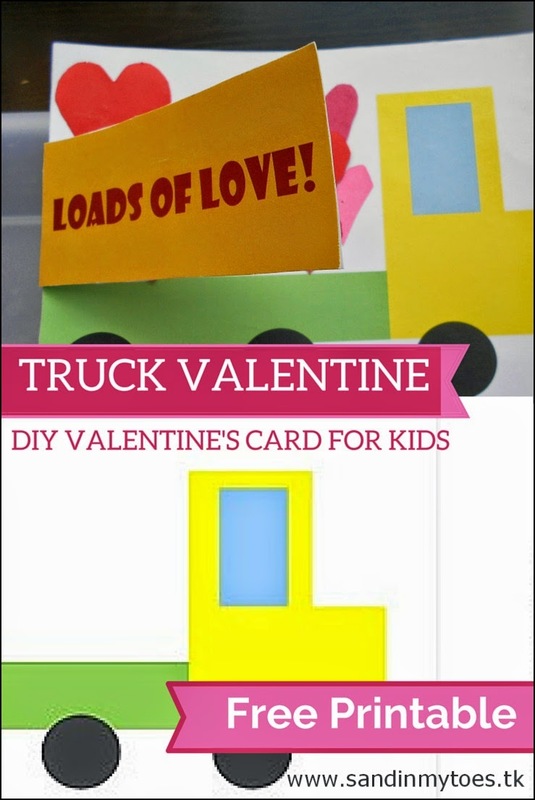 Great idea, it makes a lovely card and fun too. This is so cute! and just the right activity for little boys who loves trucks/cars. 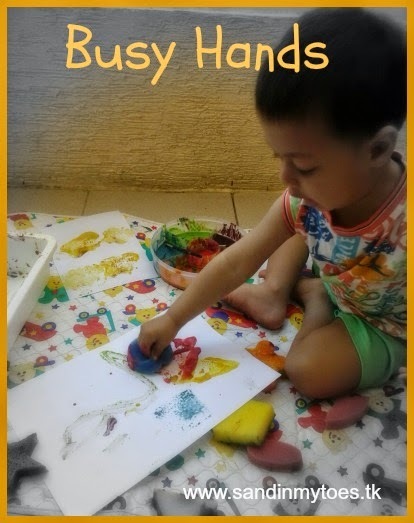 Yes, you can craft with them when they grow up! A really cute idea. I think this might appeal to Potato too. This is so adorable Tarana!! Totally sharing, so cute for Valentine's Day!! Grace says - What a great idea for a Valentines card. Very original. My 3yo will love this!